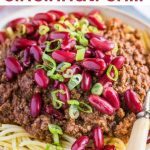 Pressure Cooker Cincinnati Chili - Easy Skyline Chili! 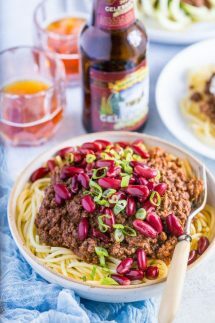 Pressure Cooker Cincinnati Chili is unique in several ways, not least because of the unusual combination of chili spices that at first glance might seem more at home in apple pie than a pressure cooker ground beef chili! Most recipes contain allspice and cinnamon and many also contain chocolate or cocoa powder, though I’ve omitted the latter in my version. But it’s not only the the interesting array of spices and flavors that set Cincinnati Chili apart from others, what really makes it different from other chili recipes I’ve come across is that the ground beef is boiled and not browned, and more often than not the kidney beans are not cooked with the beef but served as one of many optional toppings. Cincinnati Chili as the name suggests is a dish that’s much beloved and hails from Cincinnati, Ohio, but it’s origins come all the way from Macedonia and date back to 1922. Tom and John Kiradjieff originally created the chili to serve over the top of hot dogs from their hot dog stand, but eventually, they created the famous Cincinnati Chili sauce in their Empress restaurant and served it over the top of a plate of spaghetti. Years later in 1949, a former employee of theirs and Greek immigrant, Nicholas Lambrinides, started Skyline Chili which has now become almost synonymous with Cincinnati chili, though there are many other chili chain restaurants with similar offerings. I don’t like pouring off the fat after browning ground beef as you are also throwing away a lot of the flavor that’s included in the meat juices. As this recipe does not brown the beef first I recommend that you use a 90% lean ground beef which has enough fat to lend plenty flavor, but you won’t see it floating on the top of the meat sauce. Another tip if you prefer to cook with ground beef with a higher fat content is to make this a day ahead and let it sit overnight in the fridge then it will be much simpler to remove as much fat as you prefer. 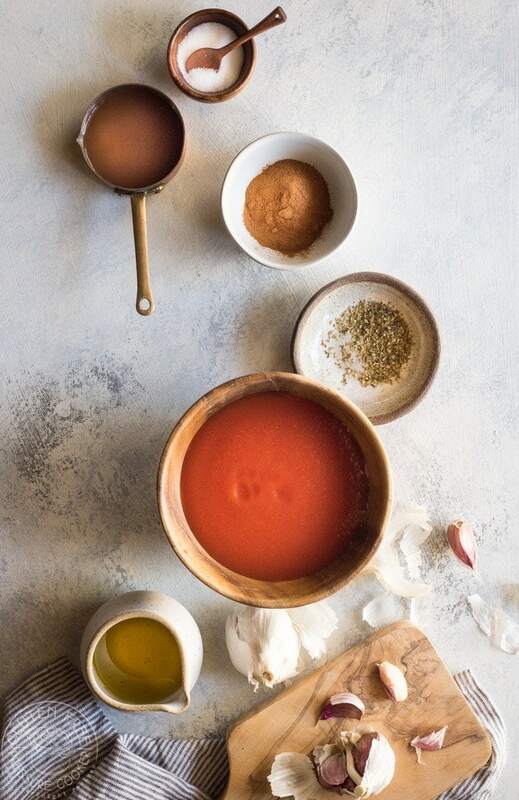 Do not put the tomato sauce into the pressure cooker first as it has a tendency to burn on the bottom of the pot and this may prevent it from coming to pressure, so it’s best to add it after it’s come to pressure and while you are simmering it. Many of the authentic recipes for Cincinnati Chili add chocolate in some form, so if you’d like to add it to your version I’d suggest the addition of 2-3 tablespoons of cocoa powder along with the other spices. Another tip if you want to make a Paleo version, simply omit the Worcestershire Sauce, replace the brown sugar with coconut sugar, and serve over the top of zoodles instead of spaghetti. The image above shows it served over zoodles in the top right bowl. What is Five Way Cincinnati Chili? If you visit a restaurant serving Cincinnati Chili they will usually have several options for ordering your chili and they include various toppings in a set order. Sometimes they are also topped off with oyster crackers, but as we are making a gluten free version that’s not an option here. I also went with a white Monterey Jack cheese as my kids prefer that, but the traditionally it’s just topped with regular cheddar cheese. 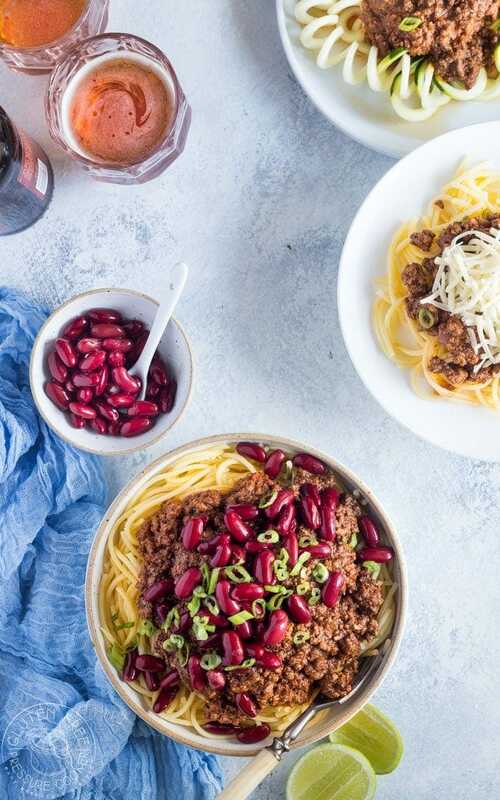 A quick and easy Pressure Cooker Cincinnati Chili recipe that's been adapted for your Instant Pot or Electric Pressure Cooker. Turn on the saute function in your Instant Pot or pressure cooker and add the oil and then cook the onions until soft, about 5 minutes. Add garlic, chili powder, oregano, cinnamon, allspice, and cloves until fragrant, about 30 seconds. Next, add chicken broth, cider vinegar, brown sugar, Worcestershire sauce, 1 teaspoon salt, and 1/2 teaspoon pepper then stir in the ground beef - make sure you add it in broken up into pieces, not in one big slab. Then add the tomato paste on the top. When the cook time time is up allow the pressure to drop on its own (NPR - natural pressure release) for about 10 minutes, then release the rest of the pressure before opening. After you open the lid add the tomato sauce and stir well to combine. The chili will still be fairly liquid at this point, I find it's much more flavorful if you let it simmer on a low heat (I chose the lowest saute setting on the Instant pot) until the liquid reduces and it thickens up, It only took about 5-10 minutes for mine to thicken up. Serve over gluten free spaghetti with your toppings of choice. Servings - It assumes 8 servings and is does not include the spaghetti, or any of the other toppings including beans. Beans - In a Cincinnati Chili the beans are usually served on top of the meat, but if like me you don't mind either way you can simply add them with the meat when it cooks, or warm them through at the end when you add the tomato sauce. This was SO good, I can’t wait to make it again!!! I have no idea if it’s a legit Cincinnati Chili (never been there) but it tasted fantastic so this is going on our regular dinner rotation.